Michael Oliver’s decision to allow Millwall’s second goal in their FA Cup victory over Everton immediately provoked howls of derision across the board. The crossed free kick pinged around the penalty area before bouncing off the arm of Millwall’s No.5 Williams into the goal to equalise. Despite Millwall protestations, the goal was good. Oliver was correct to let it stand – for now. Oliver ruled correctly that the handball was accidental. It simply bounced onto Williams' arm and into the goal. He really didn't know anything about it. So, no offence. By the time next season starts later this year, the handball law will most probably have changed to disallow such goals. This was the statement from IFAB, FIFA’s law-making body, last November. So this will reverse the decades old law that for a handball to be an offence it has to be deliberate. Until now a goal could be scored because of accidental handball. The law change should end that anomaly. I pity the poor criminal who tries to make a run for it from this Detective Sergeant. The referee was off duty on Saturday, but the fitness he undoubtedly needs in his job as a copper meant he had the game by the collar, using the positions he was able to get into to make decisions from a perfect spot 10-15 metres away for the whole match. Referees looking to get themselves climbing the promotion ladder should have been watching this game (although admittedly an arctic blast chilled the bones of this Assessor on Saturday afternoon). "Excuse me Sir, how long till kick off?" This is not soccer! I was an hour early to observe the young ref in his local league game in East Kent. The four football pitches on the local park were still deserted, but 30 or 40 blokes were going through warm-up routines on their rugby pitch, along with the referee. As a former rugby player, I always enjoy watching a game and have always had masses of admiration for rugby refs, who officiate a hugely complex and physically violent sport. On the whole, Mark Geiger had a good match in very trying circumstances on Tuesday night in Moscow, where Colombia played a brand of "anti-football" that's not seen that often these days. 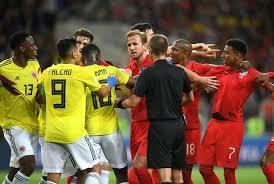 Colombia, with several stars of international calibre in their side, resorted throughout the match to intimidation of the opposing English players and match officials alike. So be it. That's no rare occurrence and Geiger, who must be ranked as a contender for a semi-final appointment if not the final (which I'm pretty sure will go to a certain German ref called Felix now that the champions are back home nursing their wounds), was handling the game well, clamping down on Colombian hystrionics with 4 yellows in a 12-minute period to try to bring the game back under control with a burst of severity. The incident I want to discuss shows the structural weakness of the VARS and portrays just how, between two top referees, they can still manage to get the decision wrong. The game was still goal-less towards the end of the first half when an England free kick near the edge of the Colombia penalty area erupted into chaos. With pushing and shoving going on everywhere, Geiger cannot be blamed for not seeing a specific incident involving Jordan Henderson and Colombia's Wilmar Barrios. Barrios, amidst the shoving, aimed the back of his head at Henderson's chest and then jerked his hear up towards Henderson's face, catching it a not very damaging glancing blow. Henderson, probably unnecessarily, hit the ground. Geiger hadn't seen the incident but the VARS decided to investigate. This was a clear case of Violent Conduct and should have resulted in a red card. "Mark, there was violent activity in the wall there. You need to go and have a look at the pitchside monitor because you may need to give a red card." Geiger, who was in tune with the tempo and heat of the game, would most probably have seen it was a red, but between them, they didn't even bother taking another look. So, yet another issue that joins the growing list of issues that need to be resolved when it comes to using VARS. And it again raises the question of whether it was wise to jump in to using VARS so quickly, when it's hardly been tried and tested. Poland referee fails key test: "Don't influence the game's outcome." Nawaf Shukralla meant well, of course. The Bahraini referee in the middle for the biggest match of his career, wanted to get the injured player back on the pitch as quickly as possible to restore balance between Poland and Senegal. Waving M'Baye Niang back onto the pitch, Shukralla made an error that nine times out of 10 would not even be noticed. This time, though, his trigger whistle combined with Polish incompetence to present Senegal with a goal that turned out to be the winner. The ball was deep in the Senegal half - but heading towards the Polish half - when Shukralla waved his arms to allow Niang to re-enter the field of play. As Niang re-entered play, chaos erupted in the Polish defence and a wild hack saw the ball hoofed into the Polish half and left Niang closer to the goal than Poland's defence. He sprinted after the ball, got to it before Poland's goalkeeper, and scored to make the score 2-1 to Senegal. The referee's mistake was in allowing Niang back on too soon. He heeded the screams and shouts of the Senegal bench - and probably his 4th official - to allow him back on quickly, while the action was in a neutral part of the pitch. Referees are taught not to allow players back on either until the ball goes out of play or when play is in the player's own half. 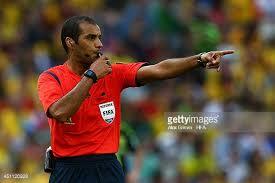 Shukralla, in his defence, can argue that play was indeed in Senegal's half when he waved Niang back on. But he didn't anticipate what was going to happen, that play can break so quickly. Also, he should have resisted pressure on him to allow Niang back on, until play enters a "safe" time when the referee's decision will not result in the threat of a goal - at either end of the field. It's very sad when a well meaning error comes back and bites a ref. His intention was good, it's just that he jumped a little too quickly. Another ref who's probably on his way home now. It's hardly surprising that VARS can't cope with the anarchy of corner kicks. British TV made a huge deal last night of two corners where Harrry Kane was clearly wrestled to the ground. But at the same time, English attackers and their Tunisian markers were indulged in all kinds of nefarious behaviour that makes it virtually impossible to make a clear ruling at a corner. English pundits screamed for a penalty for their beloved England, but the sad truth is that there were probably three or four separate fouls happening at the same time. The referee was probably watching the action itself, the drop zone where the challenge for the ball actually takes place. Meanwhile, around the rest of the penalty area, players were pushing, grabbing, holding each other in a perverse ballet that has gradually developed over the years into an anarchic situation that referees simply cannot deal with. And last night we found out that several dozen TV cameras and expert Video Assistant Referees sitting in Moscow, far from the Volgograd action, were equally incapable of deciding whether a penalty should be awarded. Presumably, the VARS in Moscow ruled there was not clear evidence for a penalty because there was just too much going on in the penalty area, too many players fouling each other. It would indeed appear that in one of the incidents, England's Stones pushed his Tunisian marker to make space for himself. So what's the solution? It would appear that the only way to go is for teams to be advised that unfair decisions will be given, that the referee will punish the worst foul he sees, until the players learn to behave themselves. Far from satisfactory it's true, but a lot more honest than the nonsense spouted by FIFA's refereeing bosses Massimo Busacca and Pierluigi Collina before the World Cup. With 25 cameras, Busacca said, "it will be quite impossible to miss fouls. " "When it's clear there is an obvious mistake, the VAR intervenes," he said. Note use of the word "clear". Last night it may have been clear that Kane was fouled, but it was also clear that several other fouls were taking place at the same time, so which one to penalise?